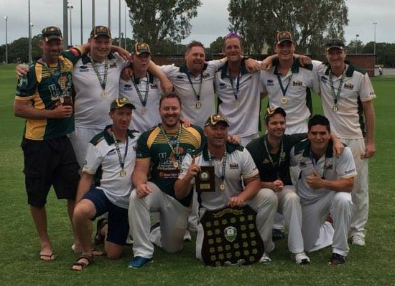 On the 25th March 2017, the Hawks commenced Grand Final appearances in both 4th grade against Broadbeach/Robina Cricket Club at Mallawa Sports Oval and in 5th grade against Surfers Paradise Cricket Club at Sir Bruce Small Oval. The chase got off to a bad start, losing the first wicket early. However, a 46 run partnership from B.Daley and D.Rogers carried HPPCC to 2/50. When B.Daley was dismissed for 35, HPPCC had slumped to 5/73, still 75 runs required for victory. A 48 run partnership between L.Hansen (36) and E.Baker (13) steadied the ship for HPPCC and got the target to within 20 runs. The lower order then stepped up and took HPPCC to needing 5 runs from the last over, 2 wickets in hand. You could cut the tension with a knife. B.Harris on strike, first ball, FOUR down the ground. 1 required off 5 balls. Next ball of the over was down leg side with the umpire indicating a wide. HAWKS WIN! Great scenes as the players and fans rejoice and celebrate a great day and overall a fantastic season. Commiserations to 5th grade who were unsuccessful in chasing a large target of 192 intheir Grand Final. Stand out performers: M.Dobson 3/18, N.Trembath 0/17 (7), J.Ryff 29.